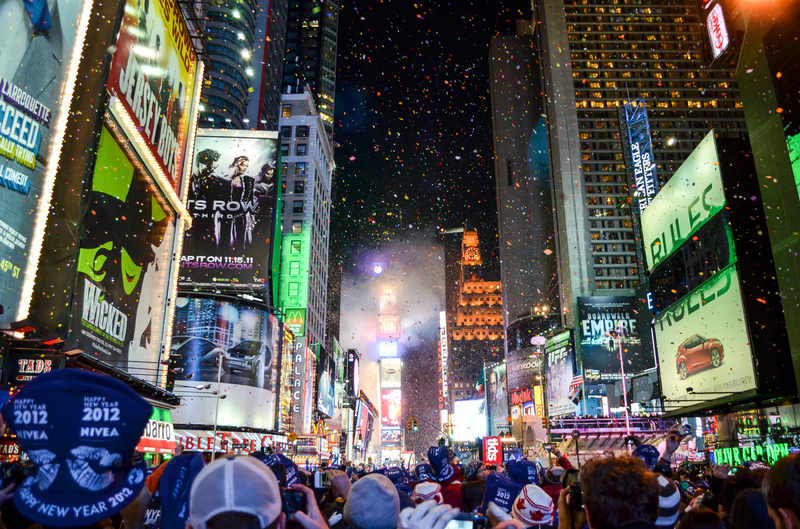 When it comes to New Year’s Eve, other cities pale in comparison to New York’s all-night parties, Times Square’s famous countdown, and our illuminating fireworks performances. (We are called the city that never sleeps for a reason!) If you’re lucky enough to pay a visit during the year’s end, review this handy guide to make the most of your celebration. Since 1907, the iconic Times Square Ball has dropped from the roof of One Times Square, slowly descending 141 feet in 60 seconds from the top until the clock strikes 12. Guests fill surrounding streets and hotels to snag a view of the drop, celebrating with live entertainment, large balloons, confetti, and hats. This year, once the the ball drops and guests kiss a loved one, The Mermaid from Futurama will kick off the party by singing “Imagine” by John Lennon, followed by fireworks. Through a city partnership with Chongqing, China, the celebration will also include a performance by the Tongliang Athletics Dragon Dance. This human-dragon dance boasts rapid movements, speedy transitions, and impressive choreography. Be sure to show up early (12pm!) to snag a spot in the street. 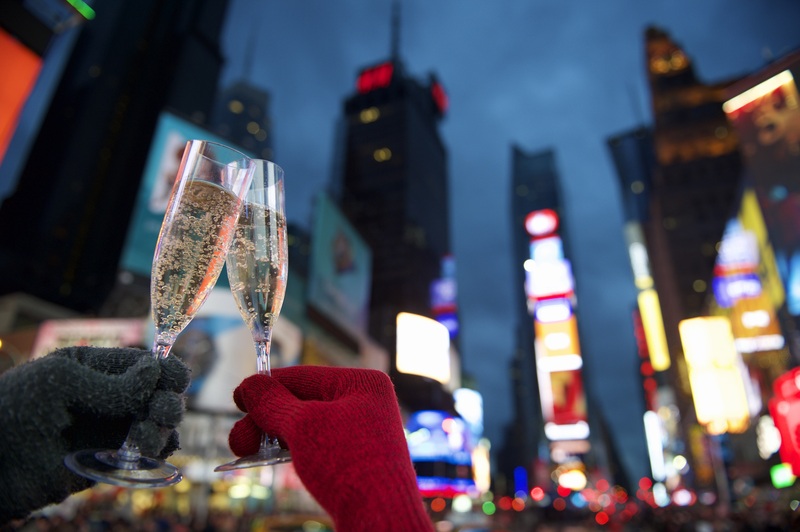 If you prefer a less-crowded celebration, we suggest heading over to the AMC 42nd Street Theater to catch a view of the ball from their terrace then watch blockbuster movies or dance all night long! A premium bar and movie snacks will be available for purchase. And if you want to bring the kids along, there's also a separate alcohol-free party full of movies, party favors, and more. 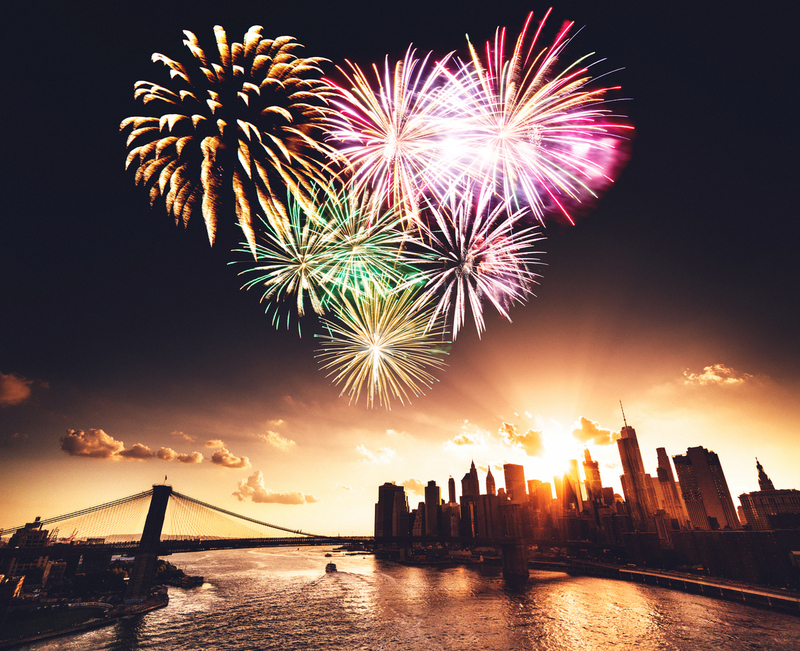 Come midnight on January 1st, the Prospect Park Alliance and Brooklyn Borough President Eric Adams will launch free fireworks, visible from Grand Army Plaza, the Park’s West Drive, and along Prospect Park West between Grand Army Plaza and 9th Street. Plenty of other festivities are also planned out in the hours leading up to the New Year. The Prospect Park Audubon Center holds a free animal-spotting expedition from 12:00pm–4:00pm, led by naturalists who educate the public on winter animal survival strategies. Nature games are also held, along with fun science activities and birdwatching. If you’d rather shop, head over to the Grand Army Plaza Greenmarket to grab a bite, shop artisanal goods, and sample local wine from 8:00am–4:00pm. Sprint into the New Year with the annual New York Road Runners Midnight run, spanning a four-mile loop from 72nd Street Transverse and back around to the west of Bethesda Terrace once the clock hits 12. First-place participants are awarded $500 for their victory, second place $300, and third place $200. Due to the large volume of participants, only guests of runners are only allowed to view the race from the sidelines. However, the public can still enjoy the park and Times Square fireworks below 72nd Street. Pre-race music and dancing kicks of at 10:00pm. Register ahead of time to secure a spot! Coined “Versailles in the Sky” The Attic Rooftop & Lounge is a French-inspired establishment chock-full of guests yearound. Given their spectacular view of Times Square, The Attic is high in demand when it comes to New Year’s Eve. This New Year’s much-anticipated theme of St. Tropez will transform their penthouse-style venue into lush, urban oasis where guests can dance ‘til dawn after watching the ball drop. The party starts at 9pm and features a five-hour premium open bar and complimentary hors d'oeuvres served until 11:30pm. A live DJ performance blasts a variety of beats all night long, including top 40 hits, hip hop, 80s, and electronica. Purchase tickets now before the venue sells out. Looking to escape the crowded streets? Ring in the New Year beneath fireworks on a private cruise along the Hudson and East River instead! As you set sail, you can also take in the city’s impressive skyline and landmarks from afar. The Infinity Yacht offers an unbeatable package deal, full of dancing, DJs, an unlimited food buffet, and four-hour open bar. The yacht departs at 9:00pm from Pier 40 and circles back by 1:00am. We’re also a fan of the Spirit NYC Cruise, which coasts down to the Statue of Liberty for a spectacular view of our leading lady from the sea. This package includes a platinum open bar, dancing, champagne toast, and rooftop lounge. The ship departs from the Chelsea Piers at 10:00pm and returns at 1:00am. Be sure to keep up to date with our other holiday blog posts, including holiday window displays, winter activities in NYC, the best of holiday shopping, and more.